General view of the machine room at Hythe Road, Willesden in May 1967. Four Heidelberg cylinder printers in the foreground. Hogarth Press was a department of J. Lyons & Co Ltd established to print the Company's growing number of business requirements. Originally known as the Printing Department the first printing facility was established on 10 January 1898 at Cadby Hall, in one room near the stables on land which WX block was built. It was staffed by eight or nine employees. The department operated two Platen Machines (foot operated), a hand stamping press and a Double Crown Wharfedale Cylinder which was initially operated by hand but subsequently by a gas engine. The Printing Department's main work at this time was printing menus and band programmes for the Trocadero Restaurant which had opened in 1896. It is worth recording that one of the early employees, Bill Watson, is credited with printing the Company's first Tea Label in 1902 on one of the hand-operated platen machines. 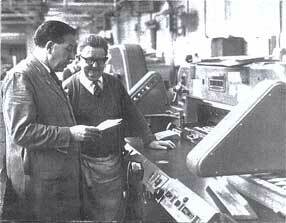 In 1901 the company employed a traveller, C. Bevis, to sell their spare printing services outside the group. As the printing and other production departments expanded, the Printing Department relocated to Hogarth Lane, Chiswick, in 1907 and adopted the name of Hogarth Press. Apprentices were taken on and served either a five of six year apprenticeship depending on the different branches of the printing industry they desired to work. The printing trade in those days insisted on standards of work in keeping with its proud tradition. There was a time when printers wore tall hats as a mark of esteem in which the craft was held. They had a language of their own: crowns, demys, quad, caps, and double elephants - all different sizes of paper. It is over 500 years since Caxton worked his printing machine beneath Westminster Abbey and links between the church and the printing industry survived until recently. The different work rooms in a print shop were known as 'chapels', every chapel had a 'father' who was elected by his colleagues in much the same way as union representatives. There was also a 'mother of the chapter', to represent female workers. A 'black friar' was a speck of ink that had marred a printing block. In 1916 the Hogarth Press relocated again to larger premises at Hythe Road, Willesden NW10, and took on more of the parent Company's printing requirements. By 1939 Hogarth Press (which did not become a limited company under Lyons) was printing 40,000 teashop tariffs per week and just about everything else the Company required in printed form including its Annual Statement of Accounts. During the war years Hogarth were commissioned to undertake special work for the Ministry of Supply, the Stationery Office, and urgent jobs for the hotels and restaurants which were set up overnight to cope with the emergencies. From 1913 right through to the 1960s Hogarth Press printed the Lyons Mail club magazine. By the 1960s Hogarth press had modernised its printing equipment and had diversified into stationery of all kinds; booklets, multicoloured leaflets and show-cards as well as the continuing need for hotel brochures and restaurant menus. For the Tea Division they produced a range of brilliantly coloured point-of-sale advertising material, order forms, and letter-heads. For the Bakery and Ice Cream Divisions a similar service was provided. The Hotels and Town & Country Catering were also big customers of Hogarth Press and their requirement demanded different types of stationery and card usually to a very high standard. Work was also undertaken for other organisations where they competed with some of the specialised printers in the trade. By 1967 Hogarth Press employed 125 staff from paper buyers, designers and accountants to compositors and machine operatives. In February 1971, Hogarth installed a two-colour Roland Rekord (German) litho machine (costing £26,000) which helped make Hogarth Press more competitive in the field of full-colour litho printing. Their design department could produce the label images required for say, bottles, and transfer these to the efficient colour presses. The Roland Rekord machine could handle up to 7,000, 25x38 inch, sheets per hour with each sheet containing several labels. They produced some of the packaging for the Lyons production departments; Soft Drink labels, Tea and Coffee labels and Lyons Maid ice lolly bags as well as office stationery for every department in the Company. Less than a decade later (September 1978) Hogarth Press installed an offset-litho press which printed four colours in one pass through the machine, together with photo-setting equipment as part of a long-term changeover from letterpress to litho. Made by Crabtree Vickers it was known as Falcon and was very compact occupying floor space in the machine room by two letterpress machines it replaced and, furthermore, it required only two staff to operate it. The photo-setting equipment was produced by Compugraphic Universal Mark IV and made in America. In photo-setting, the letters and other characters are produced on sensitised paper by directing a beam of intense light against a strip of film on which letters had been punched as blank spaces. The machine positioned the letters required against the light beam in a fraction of a second, and copy could then be tapped out as fast as the operation could type. The sensitised paper was then developed and printed in another machine and the resulting pieces of paper carrying the text, headings etc. were pasted up to form pages from which the litho printing plates were made. In January 1981 Hogarth Press moved their production to Alperton, Middlesex, where Alperton Carton Company had premises. This followed the takeover of J. Lyons & Co by Allied Breweries Ltd in 1978 and was part of a cost-cutting exercise. Hit by the 1980s recession - and a need by the new management regime to reduce costs - Hogarth Press and Alperton Carton Company, ceased trading at the end of August 1981. Alperton Carton Company had been formed in 1955 from the Lyons Box factory in Earlham Street, Covent Garden, which had been started during the First World War primarily to make boxes for chocolates the company then marketed.